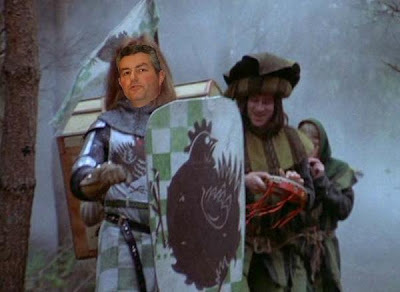 Brave Sir Regan ran away. SRMH workers begin casting ballots Thursday, with votes tabulated Friday night. The outcome hinges on whether the massive anti-union campaign jointly waged by SEIU and management convinces enough workers to reject the demonstrable financial benefits and increased job security that comes with joining a union. As I recently wrote, SEIU’s Santa Rosa campaign has been almost entirely a massive attack on NUHW. SEIU has combined full-page newspaper ads, mailers, and flyers with an estimated forty organizers on the ground this week – most wearing yellow t-shirts with slogans attacking NUHW – to prevent an NUHW victory. SEIU even scheduled a statewide rank and file training for Petaluma to coincide with the SRMH election. It brought about 400 workers to a rally in front of SRMH, but they made no effort to meet with SRMH workers or to persuade anyone to vote for SEIU. SEIU’s weak support among workers apparently led it to ask the NLRB last Thursday about the process for removing its name from the ballot. This would prevent SEIU from suffering an embarrassing third place finish, but had two potential downsides. First, it would prevent SEIU from bashing NUHW during the crucial final week. Second, since management had agreed to fair election ground rules so long as all parties to the election did likewise (SEIU had refused), SEIU’s departure would also prevent management from engaging in anti-union conduct in the lead-up to the election. After rumors spread that SEIU was leaving the contest, its local officials were reportedly overruled by SEIU staff in Washington DC on Friday morning, though the cause of SEIU’s reversal cannot be confirmed. The vaunted strength of SEIU is proving of late to be somewhat of a ceramic veneer - tough and polished on the outside, but once cracked it is next to useless. It seems now that the only hope SEIU has of saving face is for them to continue to assist the SRMH management in so totally muddying the waters as to generate a 50% no-union vote. This no-union vote better not go down! I was born there, my mother worked there as an RN in the 70s-90s, she walked the picket line when the RNs tried to unionize, they took care of my wife when she had super-ultra-mega pick eye in both eyes, they put by motorcycle riding friend back together when his 900+lb HD Ultra landed on top of him. There is simply too much history, too much at stake for the Zombies/management to get their way! I implore the workers to vote their conscience, not out of fear! NLRB to SEIU: Time to Vote!